The BillyOh 5000 Greenkeeper 8 x 6 Shed is a great looking classic style shed that has a lot of personality. 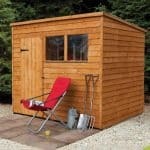 The shed has a real workshop look to it which is going to make it a standout feature of your garden. Moving around inside the shed is going to be comfortable as the roof is made to be that little bit higher than the norm. The large double doors ensure getting in and out with your hands full is easy. The four fixed windows look fantastic and they also will allow a lot of natural light inside the shed. 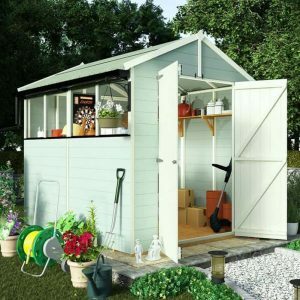 This is not just a very practical shed, it is also a gorgeous looking one as well. Made with some very smooth looking tongue and groove shiplap cladding, this is a shed that has been designed to last for many, many years. 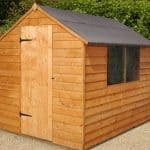 The cladding is joined with a strong frame that makes this one of the most robust 8 X 6 sheds on the market right now. Styrene windows are ideal if you have kids playing in the garden and the tongue and groove roof is strong, but also very easy on the eyes. 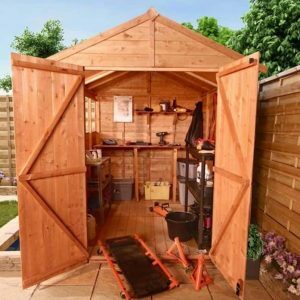 This shed is also great if you want to have some say in the design of your shed as there are a ton of different customisation options and extras for you. 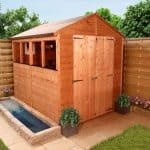 The BillyOh 5000 Greenkeeper 8 x 6 Shed is a very smart looking wooden shed that has a classic shed kind of style to it. 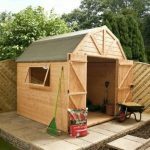 We really like this somewhat old school look and feel that this is going to be a popular shed with people who want something that looks a little bit more traditional. 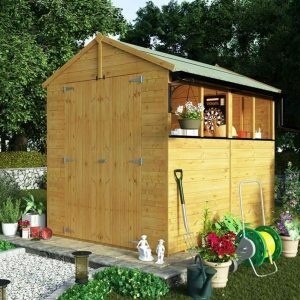 The width of the shed is 6 feet 5 inches and the depth is 7 feet 10 inches which is a good amount of floor space for you to make use of. We like the headroom this shed offers as along the ridge it is 7 feet 3 inches which is a little taller than you would normally get in an 8 X 6 shed. The eaves at 5 feet 9 inches high are right around what we would expect in a shed of this size. For the roof they have gone for an apex roof and it really stands out thanks to being over 7 feet high. The roof is covered with some very classy looking green mineral felt. Under this though really took us by surprise as they have gone for tongue and groove boarding for the roof. This of course is strong and able to take the weight of even the heaviest of snowfall, but also ensures the roof looks fantastic as well. The BillyOh 5000 Greenkeeper 8 x 6 Shed has some of the smoothest looking cladding we have seen on a 8 X 6 shed. The way this cladding is interlocked gives it such a smooth and classy kind of look. But as well as being easy on the eyes, this cladding is able to withstand a real beating from the rain, wind, snow and anything else our awesome British weather can throw its way. A 35 mm x 27 mm frame is what keeps the whole shed together and this is a very robust frame. We feel that this is going to be one very sturdy shed and have a real strong feel to it thanks to not just this frame, but the way it is attached to the cladding. One thing that took us by surprise was the fact that there is no floor included with this model. If you want a floor you have to add it as an extra. Now to be fair the floor is only an extra £34.99 for a basic solid sheet boarding floor, but we do feel they could have just added this to the shed and raised the price by £34.99 and people would not have batted an eyelid. If you want a floor that matches the roof, then for £47.99 you can add a stronger tongue and groove boarding floor. The BillyOh 5000 Greenkeeper 8 x 6 Shed will have a basecoat treatment so it will be ok during installation and shortly after construction, but you will have to give it a good coating of wood treatment shortly after construction. 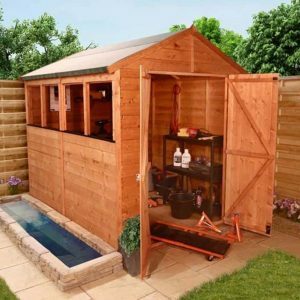 We suggest that you try and do it within a week or two weeks at the most as this way you are giving your awesome new shed the best possible start to its life. A new coating of treatment should be applied once a year to keep that cladding looking smooth and rot free. 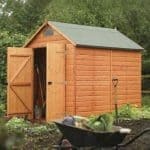 The shed will come with a ten year guarantee which protects you against rot and decay. 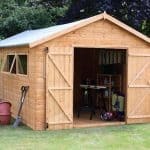 Like most other wooden sheds though, for this warranty to be valid you will have to make sure that you have treated the shed as this is required to make the warranty valid. As standard the shed comes with a fantastic set of double doors. These doors are 5 feet 7 inches high and just under 4 feet wide so you have plenty of room to get in and out of the shed. The doors have some vertical cladding which goes perfectly with the style of the shed. On the back of the door is some z framing which will help keep the doors very strong. In keeping with that theme, strong hinges have been used to secure the doors to the shed. One side of the BillyOh 5000 Greenkeeper 8 x 6 Shed has four fixed windows. This is actually a lot of windows for a shed of this size. These windows are made with styrene so there is no worries about broken glass if you have kids playing and throwing things in the garden. By the way, what is it with kids and throwing things near sheds? Anyway, the windows are great and will let a lot of natural light into the shed. Those large double doors are kept closed thanks to the included pad bolt. We must say that we were very happy to see a pad bolt on here and not a cheap turn catch. If you want to lock the shed though you will have to purchase a padlock, hire an armed guard or put a sniper tower somewhere in your garden. This has a lot of windows so it is somewhat lacking privacy, but we think those windows are a huge part of the charm of this shed so it would be a shame to get rid of them. But if privacy is something that concerns you, then we suggest you have a think about adding in some blinds or even just a cheap piece of cloth that will hide the items you have in the shed. As part of the Billy Oh brand the BillyOh 5000 Greenkeeper 8 x 6 Shed is all about customisation. Now you can get this plain, but they have a variety of trim and wall colours to pick from. There are three different trim colours, black, cream and slate grey which come in at £7.99 each. There are 12 different wall colours. These start off at £7.95 for harvest gold and go all the way up to £24.99 for spruce. There are a ton of extras to consider with this shed. We already mentioned the floor, but that is just the tip of the iceberg. You can add shelving which starts at £21.99 for shelving for just one side of the shed and goes up to £41.99 for a 4 feet high stack of shelves. If you are worried about rain running down the walls of your shed then they have two different guttering options for you to consider. These come in at £29.99 for one side of the shed and £49.99 for both sides. As well as this they have tool sets, security options, floor bearers and all other kind of options. 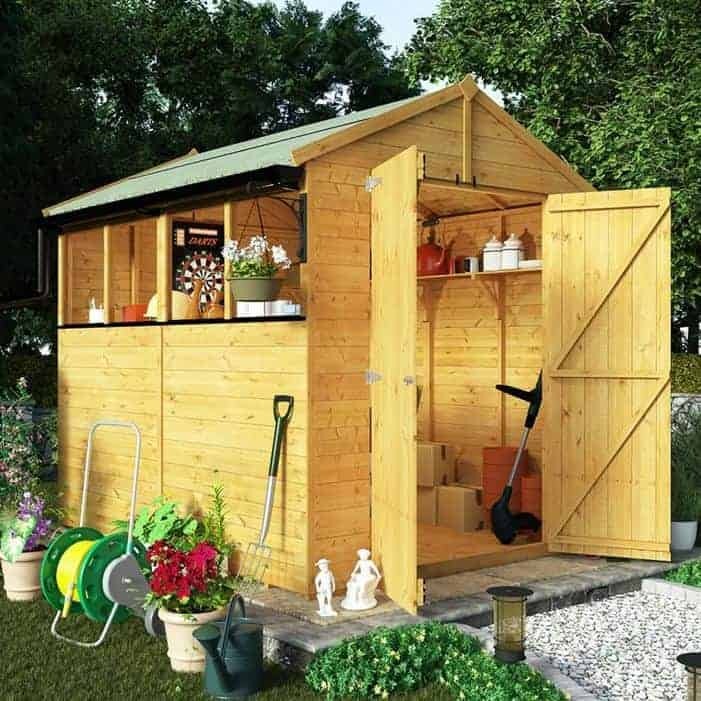 We suggest that if you like the look of this shed, you spend some serious time thinking about which (if any) of these extras are for you, as some of them are actually pretty useful. We are impressed with the overall quality of this shed and feel the tongue and groove walls, roof and the frame make it a very strong shed. We do feel that they could have added a floor, but that is our only issue with the overall quality. You are going to be able to get 20 or more years out of this shed, but you will have to make sure you look after it right. As long as you do this, you will have a shed that will give you many years of use. The storage space that this offers is great. It has plenty of floor space and that extra headroom will come in very handy if you plan on working in here for a while as it will make things more comfortable. This is a two person job and it will take 4-6 hours, but we do not see this causing you any problems. Just follow the instructions and you will be fine as this is no more difficult than any other 8 X 6 shed we have seen. With a tongue and groove roof and walls, we feel the asking price is very reasonable. We just wish the added an extra £50 to the overall price and included a floor, even a basic one as standard. Final Thoughts: We are very impressed with the BillyOh 5000 Greenkeeper 8 x 6 Shed. It has a great and classic look which we just love. Plus when we looked more closely at it, we were impressed with the materials that they have used in their construction. The lack of a floor as standard is an issue, but we feel that the price they are asking for a floor is actually very reasonable. The vast amount of extras and customisation options on offer is going to be perfect for those of you who want to tinker with the design. 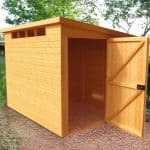 This is a great 8 X 6 shed and one that is worth serious consideration if you are in the market for a classic looking shed.